Cats! 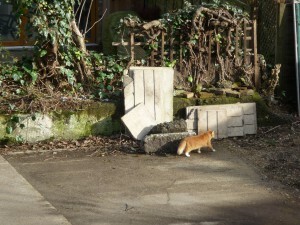 Cats! 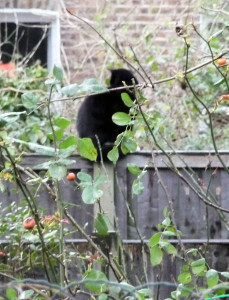 And Still More CATS! 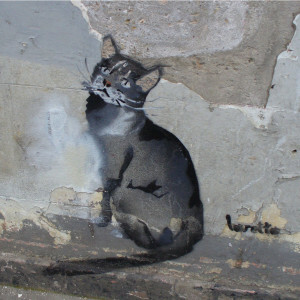 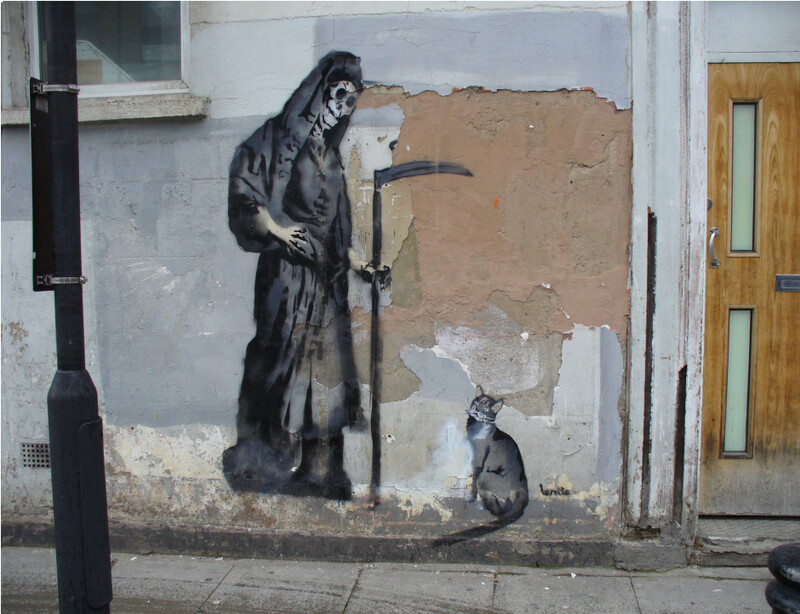 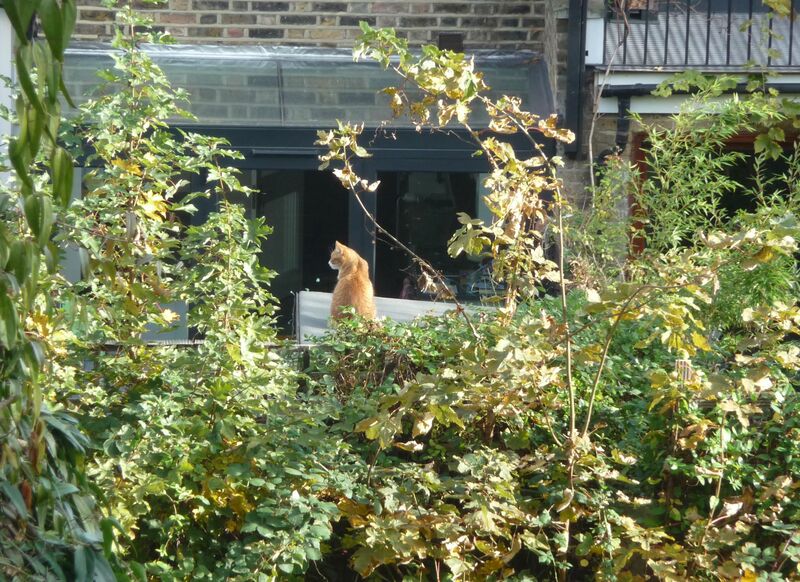 CATS are much loved pets in Highbury, as elsewhere. Dogs must be kept on leads, and now must be microchipped… but cats are free to roam where they like, and some of them have an effect on the local wildlife. 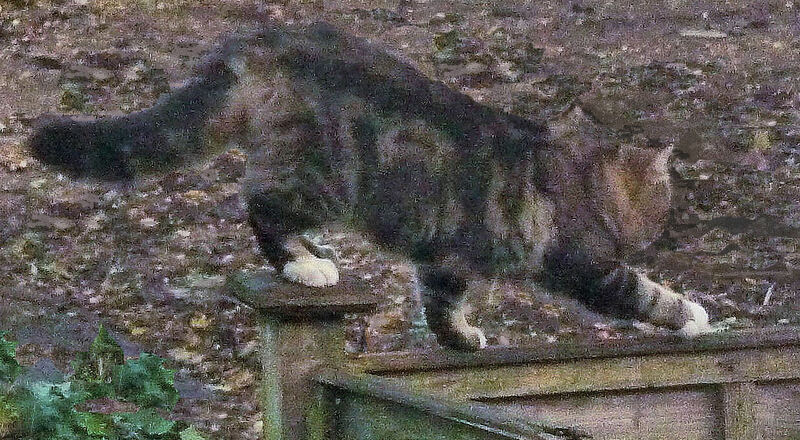 This elegant mushroom tabby moved into our garden when builders were working on our neighbour’s house. 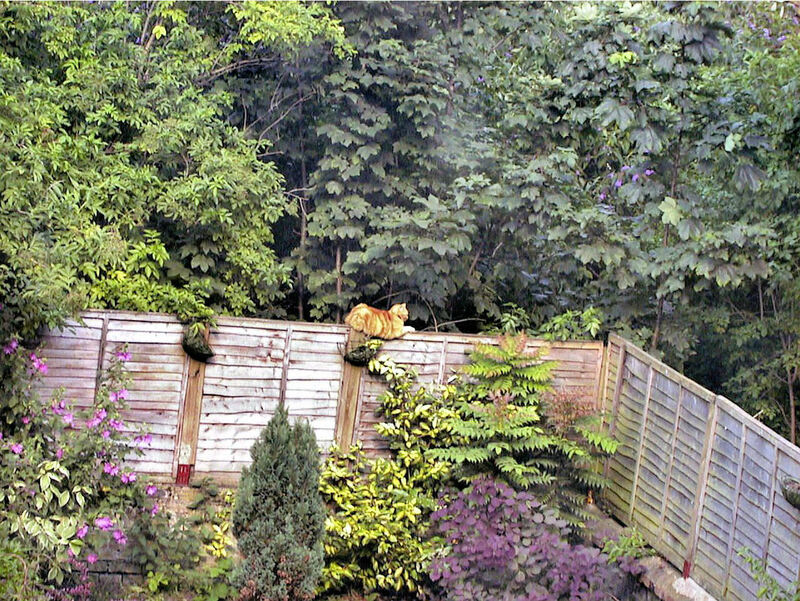 It found a sunny spot on our Clematis mound, and curled up just above the bank where suet feeders are visited by the birds. 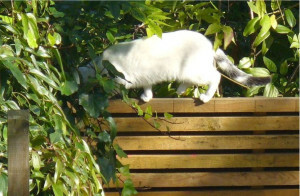 The cat was seen waking from a snooze – it yawned, stretched, and pounced at a woodpigeon sitting on our hedge who just managed to flap of harm’s way. 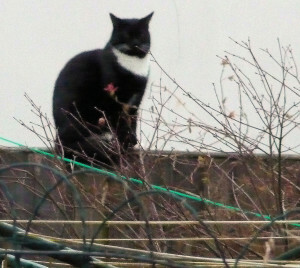 Other birds, including one young starling, were not so lucky. 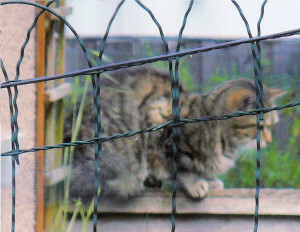 When old Tiggy was alive, he would not have tolerated this cat in his garden. He would have seen it off. 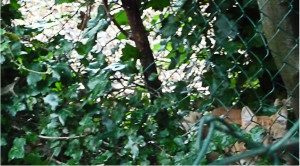 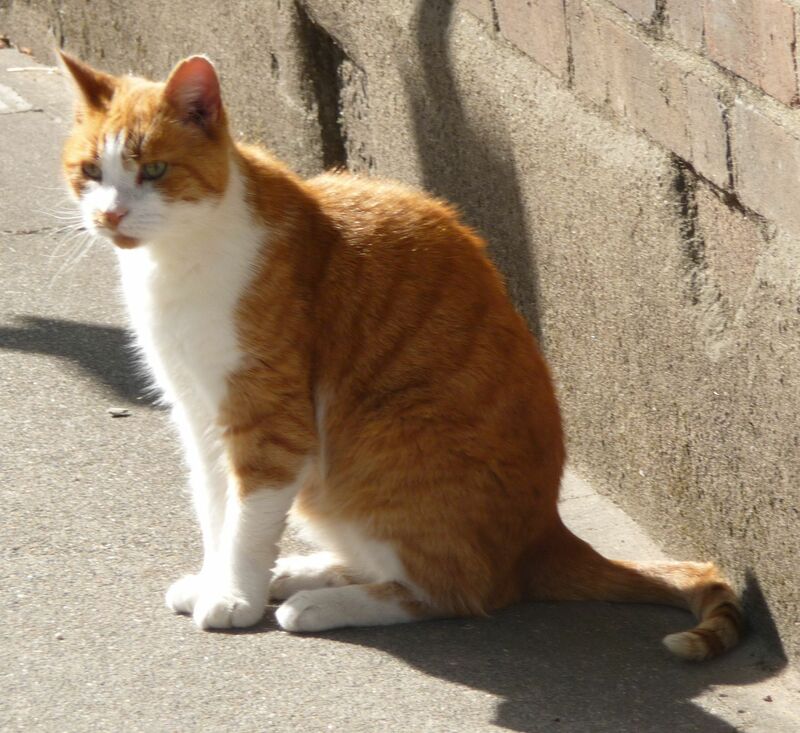 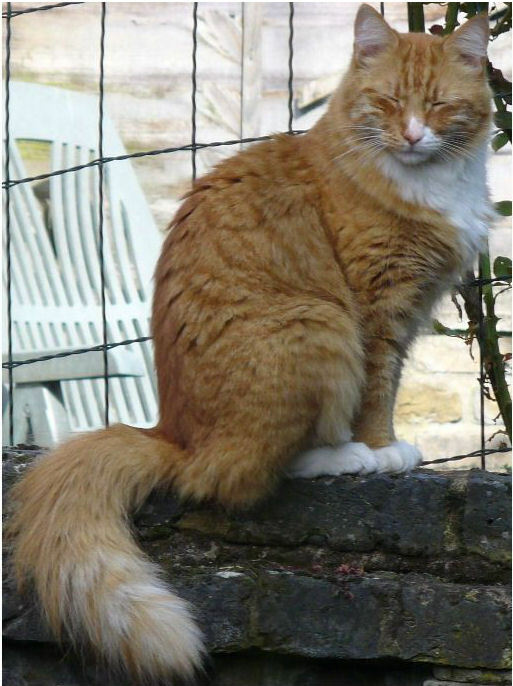 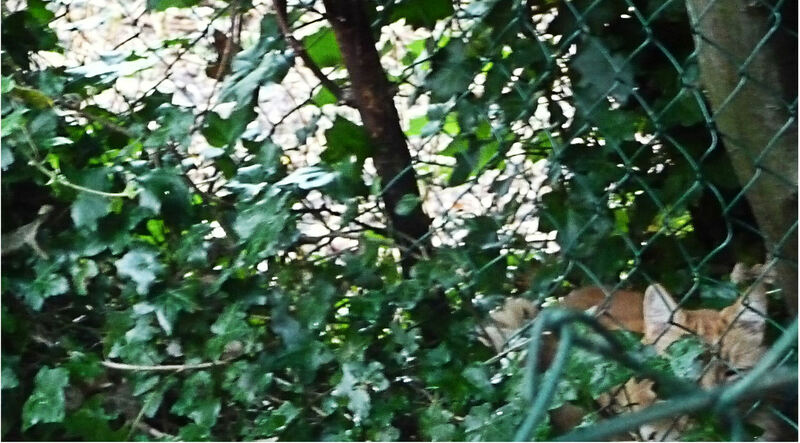 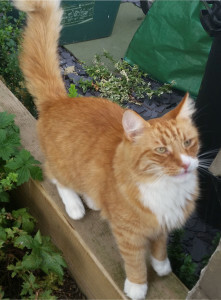 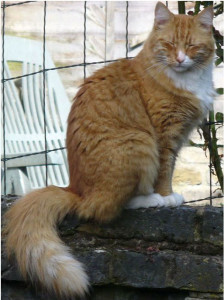 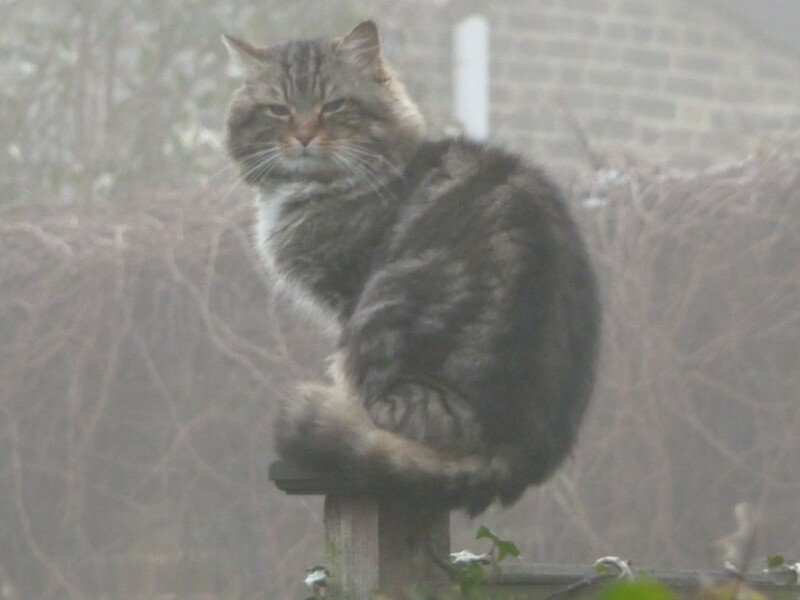 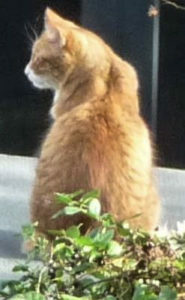 For more on the life and times of neighbourhood Top Cat Tiggy, go to the Matchday Cat page. Neighbours whose cats have gone missing put laminated appeals on the street trees giving the last known sighting, asking us to check our sheds, to get in touch. 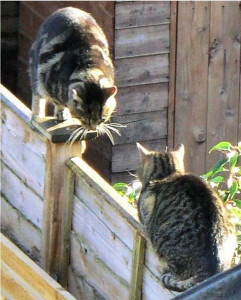 Other than these named cats, we’ve only known a few of the local moggies by name… Freddie and McGuire. 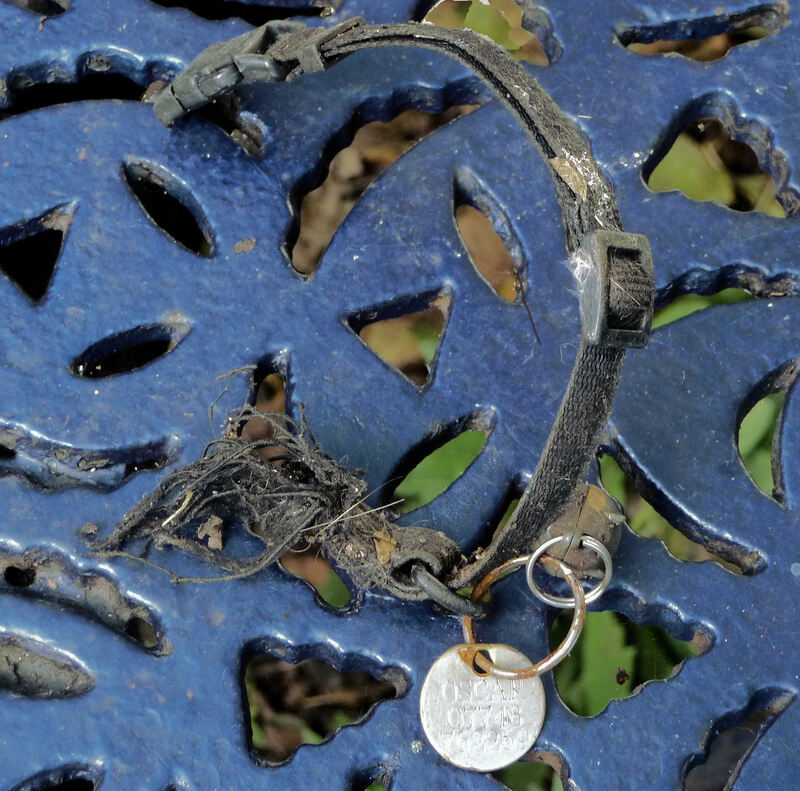 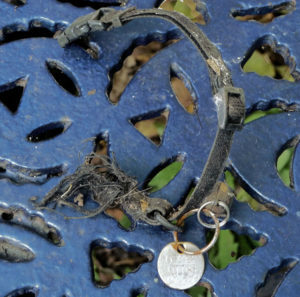 But, during repairs to one of our brick walls, this collar was found entangled in the old chainlink fence and the dense Ivy that had grown over it. 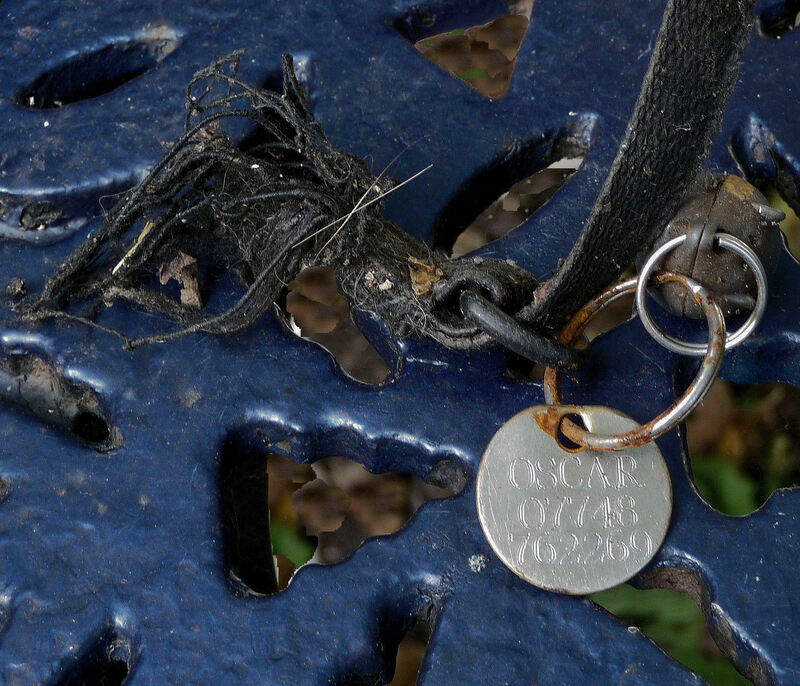 Obviously a cat named Oscar got snagged climbing in and managed to rid himself of his collar rather than be strangled by it. His owners must have been cheesed off when he returned home collarless. We’ve no idea whether this happened decades ago or more recently – whether Oscar still prowls the gardens, has left the area, or is in Cat Valhalla with Tiggy. 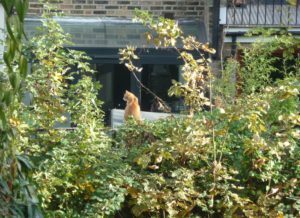 Any of these cats may catch some of the unwary birdlife… Some of them persist in getting into our garden, stalking the birds at the feeders. 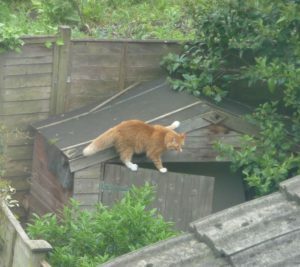 Because everything is overgrown with a number of containers, there are places a cat can conceal itself. Electronic cat deterrents require flat spaces rather than nooks and crannies to reach the intruders.